News: we are migrating this section to a new blog format in Wordpress. To access, click here. 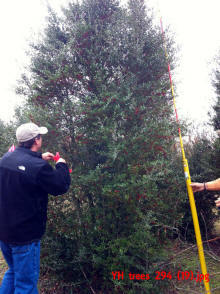 The "after" on the large yaupons tagged for the Kimbell Art Museum, shown at the nursery below. Following a two year transplant and pruning procedure, the trees were moved to Fort Worth and installed in the reconstructed courtyard. These Yaupons are at an old tree farm near Pinehurst. As far as I can tell this is the largest and maybe only collection of really large Yaupons at any nursery in the US. 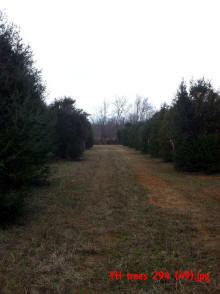 Yaupons are not fast growing trees. 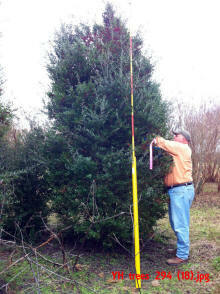 And these are only the medium sized ones at 12 to 13 feet tall. Another area has specimens that are 14 to 16' and larger. We tagged 115 for a project to be installed in about a year. They will be transplanted in order to improve sunlight access and then root pruned and limbed up into tree form over the period of a year before sending them out of state to the project site. The nursery also has hundreds, if not thousands, of very large Nellies, Emily Bruners, Americans and also a collection of perfect 6' to 7' Cleyeras. Construction of the Kimbell Art Museum Expansion, designed by Renzo Piano Building Workshop (RPBW), is under way in Fort Worth and is slated for completion in the summer of 2013. 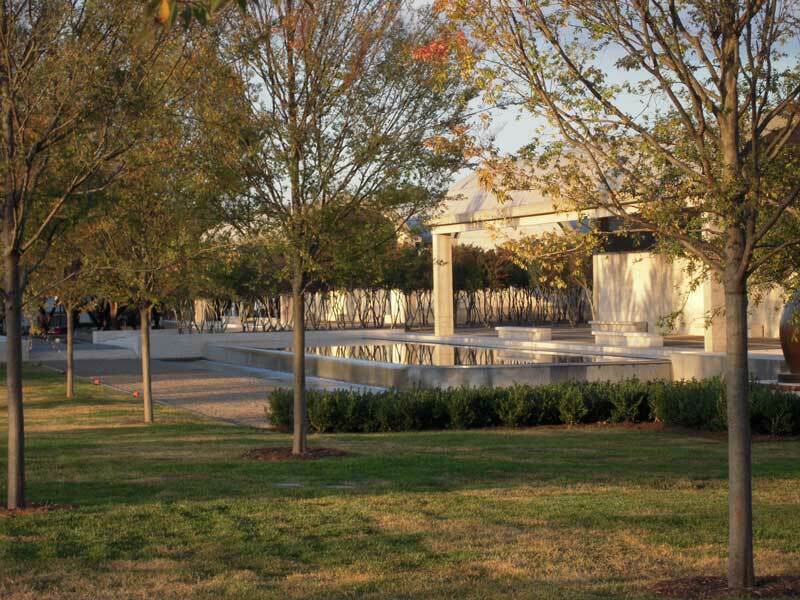 As part of that process the Museum has begun a process with Michael Morgan Landscape Architecture of Atlanta and with Harper Brawner & Associates of Arlington Texas to renovate the existing grounds. The existing museum building, designed by Louis Kahn is considered to be one of the best small museums in the world. The expansion will actually be a separate building situated about 100 feet away from the existing building and sited so as to form an architectural and artistic dialogue between the two iconic structures. 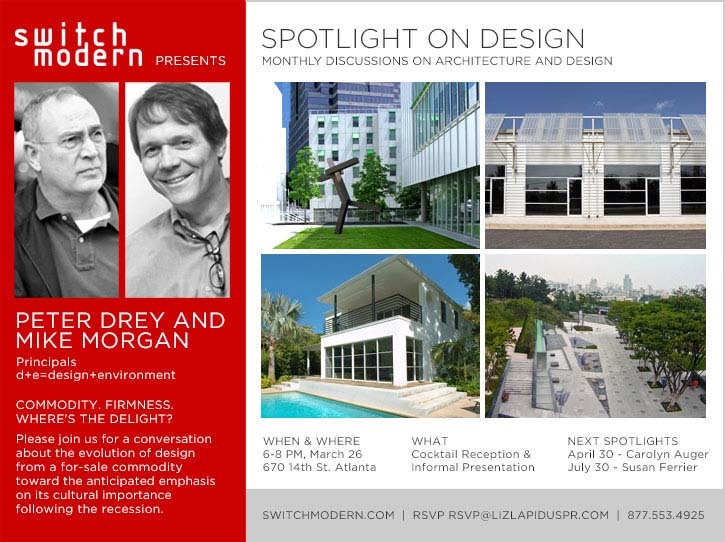 Mike Morgan collaborated with the design team to create site and landscape plans for the expansion beginning in 2008 while he was Director of Landscape Architecture with Pond & Co. Mike continues with the renovation project as owner of his new design firm, Michael Morgan Landscape Architecture which was formed in 2010. 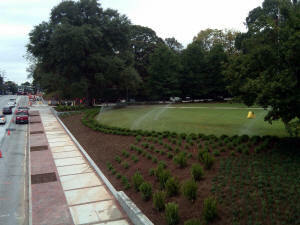 Mike also worked with RPBW as landscape architect for the Woodruff Arts Center expansion in Atlanta of 2005. Reconstruction of the Georgia Tech street frontage along North Avenue is slated to be completed during the winter of 2012. Located along the southern flank of the historic campus, the project extends from the I-75/I-85 corridor west to Tech Parkway. With the acquisitioin of the former Olympic Village dormitories following the 1996 Olympics, the Tech campus began to spill across North Avenue. 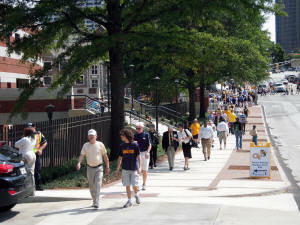 Since then, student pedestrian traffic has increased dramatically along North Avenue with over 2000 students living in the dorms and the recent addition of a major campus food court. 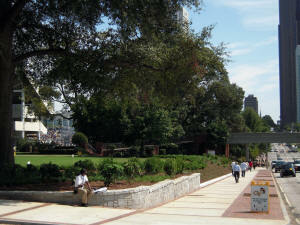 The new streetscape was envisioned to provide a safe, urbane frontage for Tech facilities, with widened sidewalks, street trees, pedestrian lighting, improved intersections, signalized mid-block crossings and attractive detailing that follows precedents set in the area by both the Campus Master Plan and the Midtown Atlanta Blueprint. The project blurs the line between street and campus, extending into the campus to provide a more accessible frontage for Bobby Dodd Stadium, Wardlaw Hall, Tech Tower, and other campus buildings and facilities along the historic frontage. The streetscape design supports urban campus living and is reinforced with parks, gardens, and connective elements. 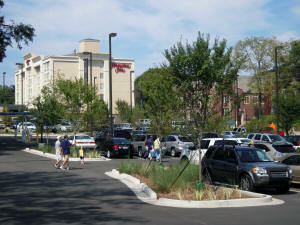 A sustainable parking lot provides a nice experience for visitors and benefits the environment by collecting rainwater internally in paring islands, and treating the runoff as it filters through native plantings and engineered soils before entering a large underground settling basin where further sediment is removed before releasing the water back into the storm system. The term “conservation” sometimes conjures up images of inconvenience and discomfort. In truth, however, this has not been the reality. The fact of the matter is that we have steadily improved efficiency and conservation over the last three decades since the 1974 energy crisis to a point where most homes, industries and automobiles operate on about half the fuel that was required before the embargo. At the same time performance, convenience and quality have improved tremendously. A source of fuel: An additional benefit of conservation is that it is also one of our nation's best and most plentiful sources of fuel. That is because every gallon of fuel, or ton of coal that is not burned today is a gallon, or ton, that we can use tomorrow. The principal is true for coal, gas, uranium and virtually all supplies of energy. But there is more. A gallon, or ton, of fuel saved today through increased efficiency is actually the equivalent of two or more gallons, or tons for use in the future. Saving energy is like saving money; it earns “interest”. Most people understand the principals of compounding interest and know that, over a certain period ot time, depending on the interest rate, a given amount of money invested in an interest bearing account will double in value. The time required for a given investment to double in value is called the doubling period. For an interest rate of 8 per cent the doubling period is just under 10 years. If you put $3000 in a savings account with 7.8 percent compounding interest you will have $6000 in 20 years, $12,000 in 30 years, $24,000 in 40 years, $48,000 in 50 years, $96,000 in 60 years, and so on. What many people do not recognize, however, is that the same principals apply to energy supplies, only in reverse. With fuels, growth takes place in consumption rather than in accumulation. As demand grows, the amount of energy consumed will double every few years just as value will double in an investment. For example, if we use a billion barrels of oil in the year 2000 and our consumption of oil is growing at a rate of about 7 percent, we will need 2 billion barrels of oil in the year 2010, 4 billion barrels of oil in the year 2020, 8 billion barrels of oil in the year 2020, 16 billion barrels of oil in 2030, and so forth. Fortunately the United States’ growth rate, in terms of fuel consumption is, while variable, typically about one third of the above rate. But even at the United States’ actual rate of growth in consumption, we have used as much fuel in the last 30 years as we have used in the previous 150 years. In every doubling period we use as much total fuel as in all previous history since the fuel began to be used. Before the energy embargo in 1975 the United States average annual rate of growth in energy consumption was even greater than it is now and had averaged about 3 percent since the beginning of the industrial revolution. At an average growth rate of 3 percent, total volume of fuel used has doubled about every 24 years. Since the mid 1970s the growth rate has dropped to about 1.5 percent. 1.5 percent is also the US Government’s projected rate of growth for the next 20 years and, at that rate, we will again double the amount of fuel we have used by the year 2050. In other words we will use as much fuel in the next 50 years as we have used since the Industrial revolution took hold in America. One could accurately say that we have fuel resources equal to all that the world, has used throughout history. In fact this argument was used in the recent flap over increasing production. Unfortunately, the flip side of that equation is that we will use the same volume of resources in the next 30 to 50 years if we maintain historic and current rates of growth. Because of conservation efforts now in place we have more than doubled our future energy supplies. Because we have cut our rate of growth in half, we have doubled the amount of time it will take to use the remaining supplies that we do have. This is the bounty of conservation. By cutting the rate of growth we radically increase the potential of our remaining fixed resources. Conservation has, in fact, come to be seen as a commodity over the past few decades. Many utilities have instituted programs to educate customers in conservation. Some programs are as simple as giving away fluorescent lights and insulation to home owners. Other programs are more ambitious and include energy audits and low interest loans for efficient appliances and air conditioning systems. There is more to this trend than simple public relations. Some utilities are even buying excess electricity from customers who don’t use it; customers who have conserved are being paid not to use excess energy. This “unused” electricity is then sold elsewhere at a profit. The economy of conservation is such that it has become more profitable in some areas for utilities to push conservation rather than consumption. A primary reason for this is that it is very expensive to bring new generating plants online. As long as the utilities have excess capacity they can continue to sell electricity profitably without huge capital investments for new plants. When demand reaches capacity and the utilities are required to construct expensive new plants, or dams, or nuclear reactors, then rates will go up and profits may come down. The questions looming ahead are: When will excess capacity be used up? Just how much time do we have left? What will the end game look like? What will happen as our fossil fuels begin to run short; as the raw material for plastics and synthetics begins to run short? Will the increase in atmospheric gasses that result from burning all these fossil fuels (as much in the next 50 years as in the past 150 years) preclude us from using fossil fuels? We must also remember that so much of the consumer goods we rely on, from nylon to asphalt, are made from the byproducts of petroleum production. The answers are not simple. As we get closer to the end of easy supplies, efficiencies and conservation will increase and we will eventually go into negative growth, thus further extending the range of remaining supplies. We must also be careful to avoid false economy. The use of electricity for automotive power is currently a false economy. Hydroelectric generation is another. Nuclear power generation is currently a false economy, although it may be less so in the future. Electricity is not a good portable power source. Batteries that are capable of powering a car are very heavy and take a long time to refill. They are also short lived and expensive to replace. In addition, the use of electricity for cars is highly inefficient. When fuel is burned to make electricity only about a third of the original energy of the fuel actually makes it through the car's engine to the road. This is due to the losses inherent in the generation process and to “line losses” wherein energy is lost to heat as it travels great distances over transmission lines. Then there are additional losses as the electricity stored in batteries dissipates with time. About five percent of the electricity stored in a battery just disappears for each day that it goes unused. Far more of the energy released in the burning of fuel in an internal combustion engine goes to propulsion than does the energy released from the burning of a fuel at a remote generating plant. Hybrids such as the Toyota Prius are far more efficient than any electric charge-and-go cars. Hybrids also have fewer emissions than the large coal burning power plants that provide most of the power for electric cars. The hybrids have a small, efficient gas engine that provides the cruising power. There is also a small bank of batteries that are charged by a combination of an electric motor and a generator that is attached to the engine. The batteries in turn provide an extra boost of acceleration through the onboard electric motor/generator. When the car is coasting and braking the motor reverts to a generator and charges the batteries with energy that would otherwise be wasted. Other emerging technologies include fuel cells and the Stirling engine. Fuel cells use an electro-chemical process to extract hydrogen from water so that the hydrogen can be burned as a fuel. The Stirling engine uses an external heat source to produce mechanical energy. The heat from burning fuel or other energy sources, such as solar, is applied to the outside of one portion of the engine while another portion is simultaneously cooled with air or water. Internal gasses circulate between the hot and cool portions of the engine and either push a piston or turn a turbine inside the engine. The Stirling engine is capable of operating on solar energy (or geothermal or other relatively low-heat power sources). Unfortunately these low heat energy sources do not work well on a mobile platform such as a car but they are quite readily available at fixed points on the ground and may eventually be used as a local generator for charging batteries to power electric vehicles as well as in homes and businesses. Hydroelectric power has cost-to-benefit problems that cannot be overcome without heavy subsidization. Many of the Hydroelectric dams produced in the twentieth century were built as much for economic development as for energy production and do not produce energy in sufficient concentrations to offset the economic and environmental costs. As productive land becomes more and more scarce, the cost of removing tens of thousands of acres of land from production is increasingly difficult to justify. New technologies and small scale conservation technologies appropriate to individual tasks will become increasingly important in the future. There are exciting new techniques for coaxing much more oil out of existing, and as yet untapped, supplies. New drilling techniques allow us to extract subterranean oil supplies with less consequence to the environment. However, conservation is by far our largest, best and most economical supply of fuel for the future.